Suhel Yahoo believes and implements this quote in his everyday life, personally and professionally. and suhel is a certified Global Career Counsellor from UCLA Extension and Univariety and this is his Success Story! Suhel hails from the city of dreams, Mumbai. He constantly strives to guide and help individuals in need. He is a Business Management Graduate specialized in Advertising, certified trainer with ‘Train the Trainer Program’, Green Belt Certified Counsellor from Univariety and also the founder of Meri Unnati | My life My way. In Conversation with Suhel Yahoo about his brainchild Meri Unnati | My life My way, he shared. To build confidence and support to guide more and more students in the right direction, Suhel was looking out for motivation in terms of a certification course, counselling workshops, expert advice and more. 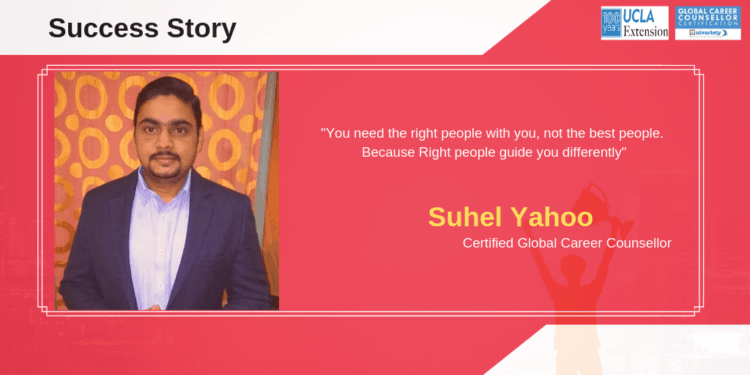 Just when he was looking for all those around him, the Global Career Counsellor Certification Course popped up on Google and in Suhel’s words…”I got exactly what I was looking for”. “Earlier I was just guiding students and youngsters with my knowledge and professional experience, but after completing the GCC course I am able to guide individuals with much more confidence.” – says Suhel Yahoo. This has helped Suhel in his journey of being just a counselor to now becoming a professionally certified and globally recognized career counsellor. Suhel is not a member of an international community of 3000+ certified career counsellors. When asked about what has helped Suhel the most during the GCC course, he answered, “Mock counselling sessions were extremely useful in terms of counselling different types of people in multiple ways. In addition to that, the reading material is very useful, it has detailed facts and knowledge about the education and counselling industry”. Overall, Suehl had a great experience not just with the course but also with the After Sales Support Team who have kindly guided him through his journey of becoming a successful Career Counsellor. As a professional, Suhel constantly strives to reach out to the ones in need. He believes in selflessly guiding individuals who really need guidance to move ahead in life, irrespective of their educational, family and financial background. Suhel now has his own methods and techniques to counsel/ guide individuals who visit him. His venture Meri Unnati | My life My way offers a customized set of aptitude test and online psychometric tests. He consults candidates on various aspects, like Career Counselling, Personality Transformation, Workshops, Steam Selection in High School and College, Preparations for Board Exams, Productive Summer Programs and more. “Univariety is a very good platform for those who want to become a certified Career Counsellor. I have searched and read about a lot of online courses but Univariety’s Global Career Counsellor Certification Course in collaboration with UCLA Extension is much more user-friendly. Not only that, they provide very good reading material, mock counselling sessions, LIVE webinars and assistance 24×7. The course is very helpful in understanding how can one make a counselling session more productive?”. Lastly, Suhel highly recommends the Global Career Counsellor Certification to those who strive to make a career in the education and counselling industry and dream to become a successful career counsellor.